Samsung Galaxy A series phones are all over the news. 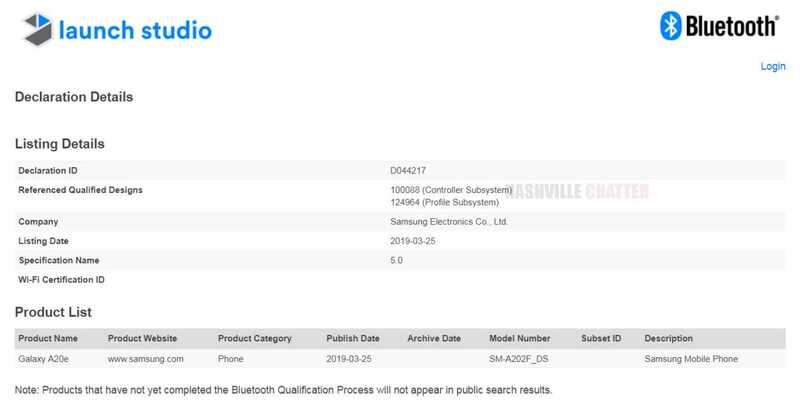 The latest news is that of Samsung Galaxy A20e with model number SM-A202F/DS which has been certified by the Bluetooth SIG body today. Galaxy A20e has already been certified by the Wi-Fi Alliance body which confirmed that the phone will ship with Android 9 Pie OS. Today’s Bluetooth listing confirms that the phone will support the latest Bluetooth version 5.0 but apart from this, the listing doesn’t reveal anything else. The phone could be powered by Samsung’s in-house Exynos processor and the processor used could either be Exynos 7885 or Exynos 7884, which is the same processor used in the recently released Galaxy A10 phone. The phone has a battery capacity of 3000 mAh, which is considerably smaller than the battery capacity of Galaxy A10, which has 3400 mAh battery. In addition to Galaxy A20e, there’s one more phone in the Galaxy A20 range, namely the Galaxy A2 Core with model number SM-A260F. Galaxy A2 Core is the only Android One phone in the 2019 Galaxy-A series phones and it has a 4.96-inch screen. Galaxy A20e is likely a downgraded version of Galaxy A2 Core. Being a budget phone, Galaxy A20e won’t support fast-charging. The phone could have a teardrop notch, similar to Galaxy A10 and a few other A-series phones. Galaxy A20e is expected to have a 13 MP +5 MP camera at the rear and a single 8 MP camera for selfies. Earlier in the day today, we found specs and leaked images of Galaxy A60 and Galaxy A70 phones, which are likely to be announced soon. Samsung Galaxy A10, A30 and A50 were recently launched in India and last week the Galaxy A40 was released in Russia. There’s an upcoming event on the 10th of April where we can expect more phones to be announced.